Richard Boyle Wolfe, known as R. B. Wolfe, was born on February 16, 1862, in Liberty Township, Clinton County, Iowa. His parents were John Richard Wolfe, an Irish Catholic farmer, and Honora “Nora” Buckley Wolfe. He was the youngest of seven children who survived to maturity: James Buckley (b. 1844), Patrick Bernard (b. 1848), Johanna (b. 1849), John Buckley (b. 1851), Maurice Buckley (b. 1855), Margaret I. (b. 1857), and Catherine “Kate” (b. 1860). Two sisters, Margaret and Catherine, died in infancy. Wolfe was educated in the public schools of Liberty and Grant townships and graduated from DeWitt High School. In 1890, he received a bachelor of laws degree from the State University of Iowa in Iowa City, beginning his law practice in DeWitt, Clinton County, that September. (His brother Patrick also practiced law in DeWitt, although at the time he was serving in the Iowa Senate.) R. B. Wolfe was elected mayor of DeWitt in 1892. On August 5, 1896, Wolfe married Hannah Dunnan, a native of DeWitt, at Saint Joseph’s Catholic Church, in DeWitt. They had four children: John Richard (b. 1898); Francis Dunnan (b. 1900), Winifred M. (b. 1903), and Mary Gertrude, whose birthdate is not known but who died as an infant in December 1906. Wolfe lived his entire adult life in DeWitt working as an attorney. Notices in the Oxford Mirror during the winter of 1906–1907 suggest that he owned 140 acres of land three and a half miles southeast of Lost Nation, Sharon Township, which he sought to rent. On October 7, 1909, the same paper reported that Wolfe’s brother John sold him eighty acres from his farm. 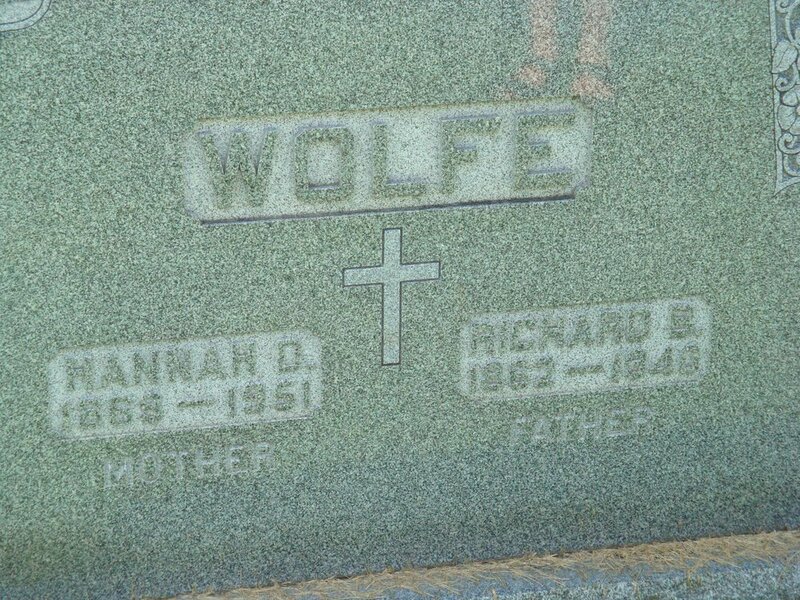 Wolfe died at his home in DeWitt on October 17, 1940; his wife died eleven years later. They are buried together at Saint Joseph’s Cemetery in DeWitt.